One of the best tools in the feng shui practitioner's bag of goodies is the mirror and specifically feng shui mirror placement for good luck. This powerful tool can enhance and boost the chi energy throughout your home to bring abundance and luck. You can use any type of mirror to achieve this. There are many places inside your home where mirrors can be placed to take advantage of chi energy. When used correctly, mirrors can double your abundance. Some of the rooms in your home are possible candidates for the use of a mirror either as an enhancer or as a remedy or cure to an afflicted area. A mirror in the foyer can help to move the chi energy further into your home. The ideal placement is on either wall perpendicular to the door. This placement will allow the chi energy to move into the home. 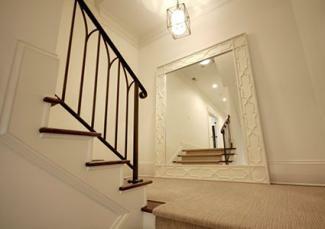 A common foyer feng shui mistake is placing a mirror directly across from the door. By reflecting the entrance into your home, you bounce opportunities out of your life before they can reach you. This mirror placement repels all chi energy - good and bad. A narrow staircase will diminish your fortune and abundance. You can remedy a narrow staircase by visually widening it, using a large mirror to reflect it. This will also create good fortune and assist it in flowing up the staircase. A full-length mirror on the landing, facing into the upstairs area, is a great choice. If the staircase has more than one landing, place a full length mirror on the first one, pointing it in the direction of the upstairs landing. Never place a mirror along the bottom of a staircase since it cuts off your feet whenever you ascend or descend. Mirrors placed in a long hallway can help to slow down the chi energy as it moves through your home. The mirrors should be staggered on opposite walls so that they don't reflect each other. When a mirror reflects another mirror, it traps the chi energy forcing it to bounce back and forth between the mirrors and never the rest of your home. You can place a mirror at the end of a dark hallway to help reflect light and positive chi energy into the space. Make sure that the mirror doesn't reflect the front door or kitchen. 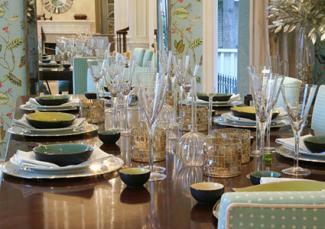 A mirror correctly placed in the dining room can double your family's abundance. In feng shui, the food on the table is seen as twice the actual amount, which symbolizes the abundance of your household with having more than enough to nourish your family. The best way to accomplish this is with a floor to ceiling mirror that reflects the table. Be sure that you place the mirror where it doesn't reflect the front door or kitchen. Be careful that the mirror doesn't chop off the heads of your diners. If the exterior of your home is auspicious with no poison arrows, then you can place a mirror to reflect a window. For example, a lush garden can be reflected into the living room to add yang energy. A mirror that reflects a water fountain, stream, or river doubles prosperity luck. Use mirror placements that will reflect pleasant sights, such as a healthy garden plants, rivers or trees. Trees promote growth energy, and mountain views enhance relationships. A full length mirror can be attached to the inside of the bathroom door to contain the negative chi. The mirror shouldn't reflect the toilet or cut off the head of anyone looking into it. Some practitioners recommend placing a full length mirror on the outside of the bathroom door instead of inside. The goal is to make the bathroom disappear by reflecting the surroundings. If you opt to use this method, be sure the mirror doesn't reflect a bed, kitchen, front door, or poison arrows, such as columns or corners. A mirror should always reflect positive aspects to double abundance and good luck. If you receive clients in your home office, place a mirror on the wall beside the door leading into your office so that it reflects clients as they enter. This will double your clients. If you aren't able to place your desk in the command position (facing the door), then hang a small mirror so it reflects the door when you sit at your desk. This prevents backstabbing and unexpected surprises in business. Don't place a mirror that reflects your desk or you. This will only serve to double your workload. Never place a mirror opposite the door to your office. This will bounce all good energy out of your office before it can enter. Avoid reflecting bills since this will double your debt. 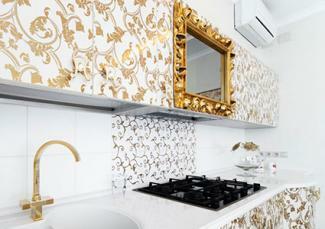 The use of mirrors in the kitchen is controversial among feng shui practitioners. One group believes you can double your abundance and wealth by reflecting the range burners. The opposing opinion is that since the kitchen is symbolic of fire, you don't want to double this with a mirror. This group believes you should avoid placing other mirrors in your kitchen, especially those that reflect the oven or range. Both agree that if the stove placement forces you to cook with your back to a door, then you need a remedy or cure. This calls for placing a small mirror behind the stove so that you can see anyone coming up behind you. There are two places you can hang a mirror in your bedroom. If you are unable to see the door from the bed when lying down, then place a mirror on the wall so that it reflects the door, but not the bed. This will give you a line of sight so you can see anyone entering the bedroom. You can also place a full length mirror on the inside of your closet door to use when dressing. Just be sure to close the door when you're finished. These two instances are the only times that a mirror is recommended for the bedroom. 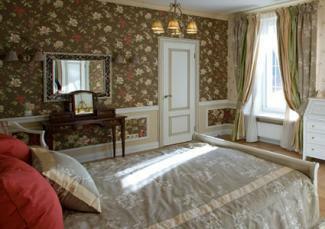 You want to avoid placing mirrors in the bedroom so that they reflect the bed. In feng shui, this is considered an invitation to a third party joining you in bed and supports infidelity. You can add other mirrors in the home along small alcoves or cramped spaces to expand the space and keep the chi energy flowing. These areas in the home are just as important as rooms since they can cause chi energy to stagnate or even stop flowing. When placing mirrors in these areas, be sure to avoid reflecting various things, such as fireplaces, dirty clothes, dirty dishes, stacks of old newspapers and other types of clutter. This type of placement is counterproductive since it doubles clutter and halts the flow of chi energy. A garden is an ideal place to use mirrors. These can capture and reflect auspicious energy. 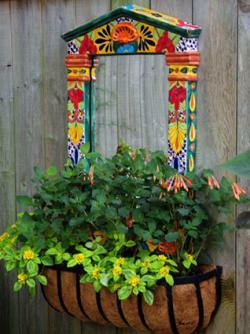 For example, you can place a mirror along a fence in the back part of your garden. When the chi energy is reflected by the mirror, it's bounced back toward the house. A mirror can double garden energy for greater abundance. A mirror can also be used to reflect light into shaded areas of your garden or reflect a water fountain back to the house. You can also place a mirror in the shaded area to attract energy into the space. Avoid reflecting busy streets or poison arrows toward your home or a neighbor's home. 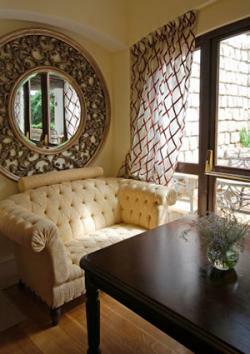 Perhaps the most popular and overused mirror in feng shui is the bagua, or Pa Kua, mirror. This round mirror, framed by an octagon shape consisting of eight trigrams, is controversial among practitioners. There are pros and cons to using a bagua mirror in your home. 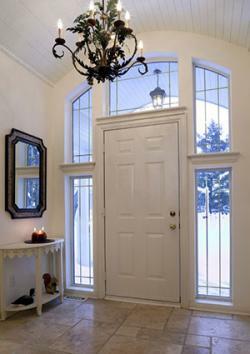 Many practitioners use bagua mirrors, recommending a homeowner place one over their doorways. This mirror is used to deflect negative energy, such as poison arrows, away from your home. Others worry about the unwanted, detrimental effects of a bagua mirror. Lillian Too advises against its use. The remedy works, but it isn't discriminatory about what and where it deflects. It will deflect positive chi away from your home and you can inadvertently shoot negative chi at your neighbors. It only takes a little forethought and planning to achieve positive results with mirrors. If you place mirrors according to feng shui rules, you are sure to reap the rewards of enhance chi energy, abundance, and good luck.